People say love makes you ‘weak in the knees’. Sometimes, injury or degeneration does so too. If the latter is your problem, then you might want to pick up one of our Knee Braces. They help immobilization and stabilization of the knee thus relieving pain due to ligament or muscular injuries. 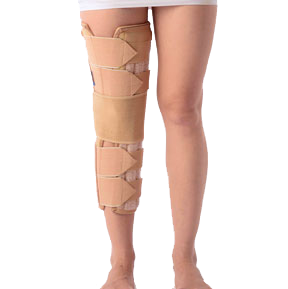 This Long Type Knee Brace in particular is ideal for if you have just had a cast removed. It has specially moulded straps provided on the dorsal and lateral sides, adjustable ones above the knee and two straps below the knee. Let’s just say it makes sure you get a snuggled fit. It has high-density foam sandwiched between the external and internal fabric, providing optimal comfort.